Playing catch-up here. There's an awful lot of radio I need to have a listen to. Let's start with news related. We're obviously living in a world that needs more extreme parodies to keep up with the oddness of reality, given we've recently had Agendum doing news shows, and now this sillier version of the BBC's Question Time. 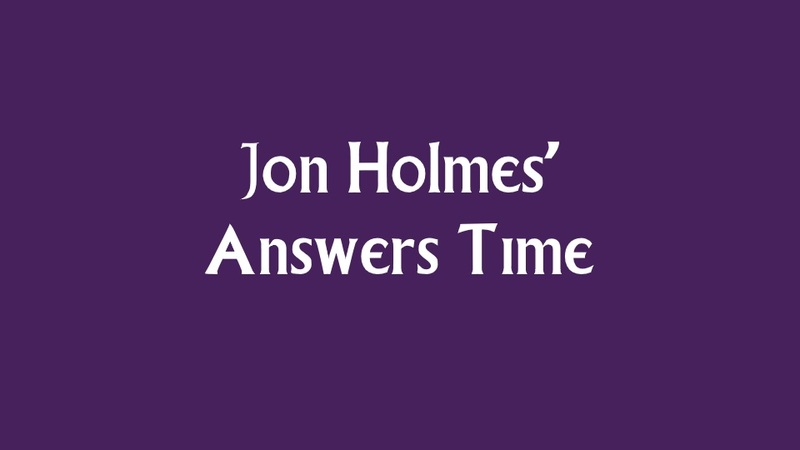 Jon Holmes, best known as the short person from The Now Show, is host, playing his own mad version of Dimbleby, to a cast of character comics, namely Jake Yapp, Alex Lowe and Ruth Bratt. The age of experts is dead, so the panel is filled with real people, or at least real stereotypes. There's repressed 1950's housewife (weirdly unmarried), a man who may have accidentally garrotted his sense of independence with the apron strings, and a strange meaty lump that might be gammon. These all start with the usual baseline opinions, but almost immediately give them a bit of the old Spinal Tap magic. They're dealing with all of the big questions currently facing society. Should food be banned? Is it safe to eat gay food in public? Does the Blondie inspired trend for glass-blown artificial organs stand up in a world where people are already considered snowflakes if they object to a little sustained sexist and racist abuse? And finally advice. Yes or no? Should it be regulated, or is the current haphazard system where it's passed down from parent to child and promptly ignored more suitable? And of course, it wouldn't be Question Time without actual questions provided by the audience, who run the gamut from academic, thoughtful and totally ignored by the panel, to the naturally ludicrous. The type of question I enjoy the most was unfortunately missing. The one that isn't really a question at all, but an excuse for the general public to rant briefly in order to win themselves a cheer in the social battle that is life. Still, there's fun with the traditional gag of selecting people to give the mike to like a game of Guess Who? It's primarily improv, with the characters established in the opening remarks, and being well maintained throughout the half hour. That does have the expected difficulties of improv, where things can run awry, or threads get lost, but it mostly hangs together. Not much of a surprise, though, given the calibre of comedians they've got powering this. Also means it does run slightly blue, which I personally enjoy, but can feel a lazy way to get a cheap gag. There is a sublime "blink and you'll miss it" zinger about furniture however. Watch out for that. Partly fills that void left eternally empty by the end of The Masterson Inheritance, and even if it could perhaps do with a smidgen more raw material and editing down, it's running pretty well. I think this was a sneaky pilot, and would not be surprised if there was more of it. Though they might need to change pretend hosts now that Fiona Bruce has turned up. To Jan Ravens, probably.